For other people named Nicholas Heath, see Nicholas Heath (disambiguation). 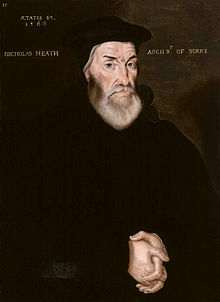 Nicholas Heath (c. 1501–1578) was the last Catholic archbishop of York and Lord Chancellor. Heath was born in London and graduated BA at Oxford in 1519. He then migrated to Christ's College, Cambridge, where he graduated BA in 1520, MA in 1522, and was elected fellow in 1524. After holding minor preferments he was appointed archdeacon of Stafford in 1534 and graduated DD in 1535. He then accompanied Edward Fox, bishop of Hereford, on his mission to promote a theological and political understanding with the Lutheran princes of Germany. His selection for this duty implies a readiness on Heath's part to proceed some distance along the path of reform; but his dealings with the Lutherans did not confirm this tendency, and Heath's subsequent career was closely associated with the cause of reaction. In 1539, the year of the Six Articles, he was made bishop of Rochester, and in 1543 he succeeded John Bell at Worcester. His Catholicism, however, was of a less rigid type than Gardiner's and Bonner's; he felt something of the force of the national antipathy to foreign influence, whether ecclesiastical or secular, and was always impressed by the necessity of national unity, so far as was possible, in matters of faith. Apparently he made no difficulty about carrying out the earlier reforms of Edward VI, and he accepted the first book of common prayer after it had been modified by the House of Lords in a Catholic direction. His definite breach with the English Reformation occurred on the grounds, on which four centuries later Leo XIII would claim that the Anglican priesthood was not valid. The question was over the Ordinal drawn up in February 1550. Heath refused to accept it, was imprisoned, and in 1551 deprived of his bishopric. On Mary's accession he was released and restored, and made president of the Council of the Marches and Wales. In 1555 he was promoted to the archbishopric of York, which he did much to enrich; he built York House in the Strand. After Gardiner's death he was appointed lord chancellor, probably on Cardinal Reginald Pole's recommendation; for Heath, like Pole himself, disliked the Spanish party in England. Unlike Pole, however, he seems to have been averse from the excessive persecution of Mary's reign, and no one was burnt in his diocese. He exercised, however, little influence on Mary's secular or ecclesiastical policy. On Mary's death Heath as chancellor at once proclaimed Elizabeth. Like Sir Thomas More he held that it was entirely within the competence of the national state, represented by parliament, to determine questions of the succession to the throne; and although Elizabeth did not renew his commission as Lord Chancellor, he continued to sit in the privy council for two months until the government had determined to complete the breach with the Roman Catholic Church; and as late as April 1559 he assisted the government by helping to arrange the Westminster Conference, and reproving his more truculent co-religionists. He refused to crown Elizabeth because she would not have the coronation service accompanied with the elevation of the Host; and ecclesiastical ceremonies and doctrine could not, in Heath's view, be altered or abrogated by any mere national authority. Hence he steadily resisted Elizabeth's acts of supremacy and uniformity, although he had acquiesced in the acts of 1534 and 1549. Like others of Henry's bishops, he had been convinced by the events of Edward VI's reign that Sir Thomas More was right and Henry VIII was wrong in their attitude towards the claims of the papacy and the Roman Catholic Church. He was therefore necessarily deprived of his archbishopric in 1559, but he remained loyal to Elizabeth; and after a temporary confinement he was suffered to pass the remaining nineteen years of his life in peace and quiet, never attending public worship and sometimes hearing mass in private. The queen visited him more than once at his house at Chobham, Surrey; he died and was buried there at the end of 1578. ^ "Heath, Nicholas (HT519N)". A Cambridge Alumni Database. University of Cambridge. This article incorporates text from a publication now in the public domain: Chisholm, Hugh, ed. (1911). "Heath, Nicholas" . Encyclopædia Britannica. 13 (11th ed.). Cambridge University Press. p. 157. This page was last edited on 4 February 2019, at 00:47 (UTC).